What do sea lions, a red bridge, cable cars, and turtles have in common? 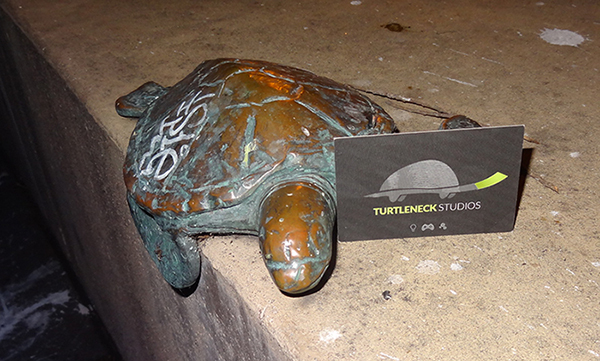 If you guessed “Turtleneck in San Francisco” then you were right on the money! Over the course of ten days, Coen, Jayce, and Alanay have had set foot on American soil to be a part of GDC 2016 in San Francisco! With the following blogpost, Alanay will take you on a ride through our adventure. And just like any real adventure, we first had to prepare our passports, suitcases, transportation, and of course, a place to stay. After readying ourselves and buying our necessary fix of snacks (we love candy), we were on our way to Schiphol Airport. The turtles were ready for San Francisco… but was San Francisco ready for the turtles? We were mesmerized by the city on hills upon arrival; a truly magical place for a bunch of touristy green turtles. But despite the many sights and attractions San Francisco had to offer, we flew to the USA with a mission: to make and find suitable business relations at GDC and present RITE of ILK on the international stage. The first days of GDC were about summits and tutorials, meeting new people, and adjusting to a different timezone (nine hours difference!). We were ready to rumble! We noticed that GDC 2016 was very VR oriented and many of the available games and technologies were fixated around this. Awesome looking UE4-based games, such as, turret-shooter Gunjack for Samsung’s Consumer Gear VR, sci-fi combat multiplayer RawData, and atmospheric RPG Chronos, amongst others, made their appearance in the VR-department. From Wednesday on, lasting until Friday, most of GDC was focused heavily on the expo. Here we were able to meet the people behind a lot of the software we use. Additionally, we were listening in on presentations by companies such as; Allegorithmic, Audiokinetic, and, of course, Epic Games. A notable highlight for Coen (3D artist) was the announcement of Substance Painter 2 by Allegorithmic. Meanwhile, Jayce enjoyed talking to the people behind Wwise (as an Audio programmer) and a Sony Audio Software Engineer, while I had fun chatting with Max Chen (Lead Cinematic Engineer), the guy behind Sequencer (at the time, a new and experimental UE4 feature for creating cinematics). 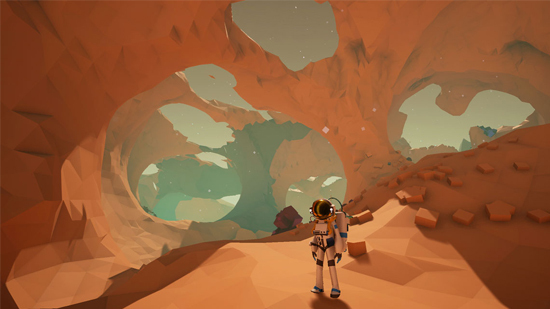 In the Unreal Engine 4 area, we met face-to-face with many fellow UE developers, including the brains and brawn behind open world exploration game Astroneer and the creators of futuristic combat racer Grip. 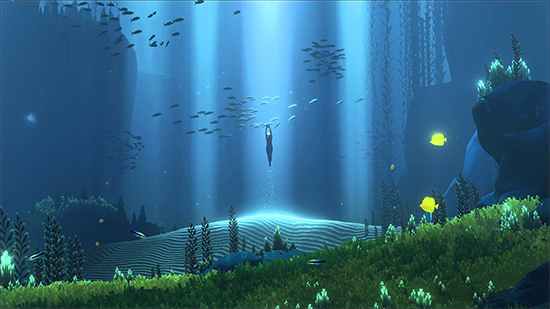 Although there was much to be inspired by, as an artist, the mesmerizing sea of Abzû got me particularly inspired. Diving into their world was calming, dazzling, and most of all, breathtaking. The event, however, isn’t just about games. We met many different types of people during our GDC visit, from smaller indie developers and software engineers to bigger companies and Let’s Players, all of whom we shared our stories and passions with. I remember carpooling and chatting with fellow developers in an Uber (thank god for Ubers) on our way to Moscone Center (GDC). At some point in time, they took an iPad out from their bag and let me play their game until we arrived. Afterward, we exchanged business cards, had small talk, and we each went on our own way. The experience was so quirky, fun, and typical GDC. Throughout the ten days, we were equipped with a laptop and/or iPad and had no problems showing off the trailer and pictures of our game. It helped in giving people a proper visual idea of RITE of ILK and it also meant that we could pitch in a pinch. The overall responses from people were good, with many eager to either help or follow our development process. With help from the stimuleringsfonds creatieve industrie (thanks! 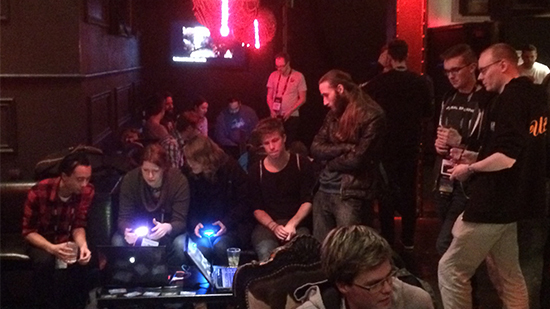 ), we were able to show off our RITE of ILK demo at a Dutch local multiplayer event near GDC and were able to acquire lots of helpful feedback and watch people enjoying our game. 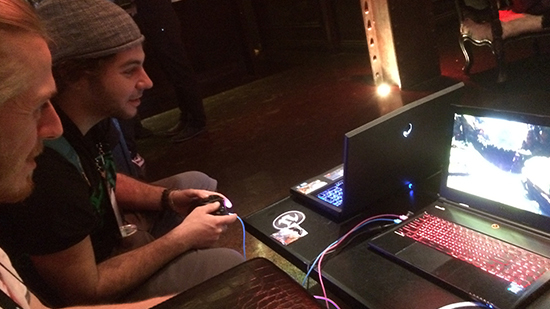 We invited several people to this event so that they could come play our game in a comfortable setting. As a side note, if you’re ever interested in going to GDC as a developer, having a clear goal makes it easier to plan your stay and helps you to not waste your time on the many parties, events, or people. You’ll be bound to meet people regardless, but it’s important to be very conscious of the fact that you only have a few days and that it is, in fact, a business trip. We went to GDC with the three of us and made sure that our attendance was spread out for a bigger reach – it wasn’t unusual to see any of us riding solo to enforce this idea. Plan thoroughly, bring at least 100 business cards, and don’t be scared! With that being said, there was a lot more that happened at GDC. We talked to important people and found suitable business relationships (mission accomplished)… but, shhh… we’ll keep them as secrets for now, don’t want to be spoiling everything right away! It’s been a great experience and we’re already looking forward to next year! It was great meeting everyone who was there and we can’t wait to meet even more people next time, maybe we’ll even get to meet you?